The raw and fierce beauty of Iceland will awe and amaze… guaranteed! The volcanic power that continues to form this island is palatable in the hum of Reykjavik and in the echoes of ageless glaciers and exploding geysers. Explore waterfalls and geysers, case the city, find out what all of the geo-thermal fuss is about and chillax in the Blue Lagoon. Our home base in Reykjavik at The Grand serves as our retreat-home as well as our practice space. A beautiful hardwood floored studio awaits morning and evening practice while their kitchen turns out delicious vegetarian and non-veggie meals to nourish and nosh on. There are two options for accommodations, Executive Rooms and Atrium Rooms. Executive Rooms guarantee a view outside, while the Atrium Rooms look towards the natural light filled lobby. Both rooms are clean, crisp with large bathrooms with heated towel racks and long tubs. Our rooms in the south are all clean and neat with en suite bathrooms. They are smaller than the city hotel rooms but with unrivaled views. Gaze out onto the surrounding fields dotted with the property’s host of Icelandic horses or towards the museum building beautifully constructed, in part, with volcanic rock. 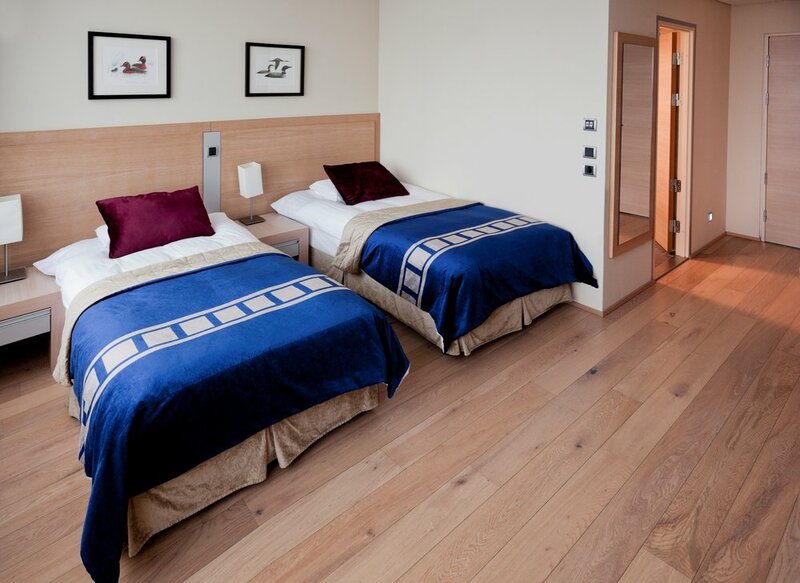 Rooms will be configured with either two twin beds or one king based on your initial room request. You will be traveling Keflavik (KEF). The airport is about an hour outside of Reykjavik and our transfers will pick you up, regardless of flight arrival time, and whisk you into town. Please note that this is strictly an example itinerary. The final schedule and itinerary goes out around 5 weeks before departure and only goes out to the teacher and then to the participants attending the retreat. Please also note that where it's mentioned "yoga class" this is your time to fill in however you'd like - a photography session, health coaching module, kickboxing refresh, writing circle, nap... whatever you fancy! Transfer to KEF and shuffle through a week’s awesome memories while waiting to board!